Let's cut to the chase: solid hardwood flooring is better than laminate. That is, it's a higher-quality type of flooring. It's 3/4 inch of solid hardwood cut from a tree. Laminate is essentially particleboard with a photo layer that looks like wood and a layer of plastic on top of that. But just because hardwood is a better-quality material than laminate, it doesn't mean that hardwood is necessarily better for your application. Laminate actually performs better in some ways, and it's a lot cheaper and much easier to install than hardwood. Laminate also doesn't need as much pampering as hardwood. 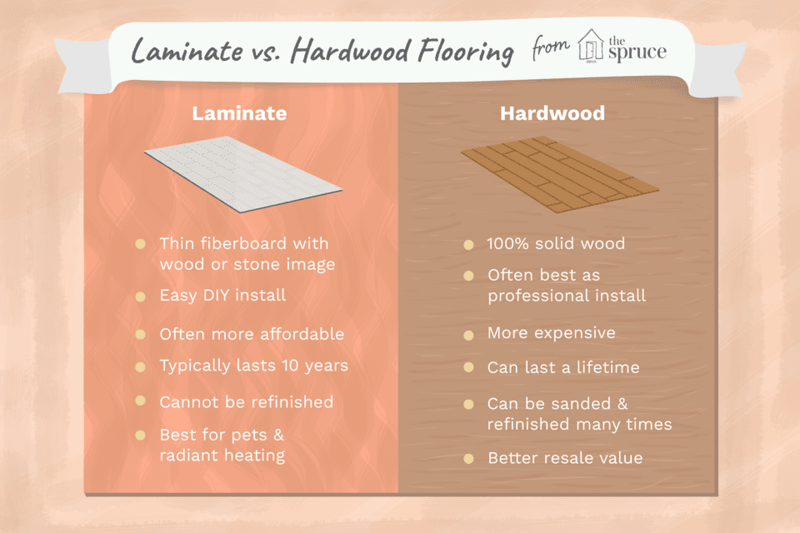 All of these tradeoffs can make the decision between laminate vs. hardwood a tough one, but if you focus on the factors that matter most to you, the better fit should be clear. Materials Laminate is thin fiberboard topped with an image of wood or stone, itself topped with a transparent wear layer. Solid hardwood is 100 percent wood (unlike engineered wood, which has a plywood base), although prefinished hardwood includes a petroleum-based factory finish. Do It Yourself Installation Very easy. Laminate flooring typically is installed as a "floating floor," where the pieces click together and need no fasteners or glue. Difficult for non-professionals to install. Rental of special tools such as a floor nailer or stapler is required. Even then, staplers do have a significant learning curve. Initial Floor Finish Never needs finishing or recoating. On the other hand, a damaged finish cannot be repaired. Prefinished hardwood flooring does not need to be finished after it is installed. Unfinished flooring must be sanded and finished after the planks are installed; sanding and finishing is a job for professionals. All solid hardwood flooring can be sanded and refinished a limited number of times. Local repairs of existing finish are possible in some cases. Cost Good-quality laminate cost about $3.00 per square foot and up. Lower-quality laminate can be much cheaper but at a loss of looks and performance. Always more expensive than laminate. Low-end oak, maple, and ash solid hardwood go for $3.00 to $5.00 per sq. ft. Wider-format plank flooring of the same species and narrower flooring of exotic species go for $5.00 per sq. ft., with prices steeply escalating after that. Durability Expect 10 years of use, maximum. Hazards that shorten the lifespan of laminate: water infiltration, scratches from chair legs and even UV rays. Hardwood flooring will last a lifetime and more. Unusual circumstances, though, like flooding, can render a hardwood floor worthless if rescue attempts come too late. UV rays will discolor solid hardwood stains and coats. Hardwood likely will need to be recoated or refinished periodically, depending on wear and care. Refinishing and Sanding Laminate flooring cannot be refinished or sanded. When it is ruined, replacement is the only cure. Solid hardwood can be sanded and refinished multiple times. Pre-finished hardwood, due to the sheer toughness of the factory-applied urethane finish, can be very difficult to refinish the first time. Resale Value Some premium laminate flooring has moderate resale value. Many flooring warranties are transferable from owner to owner. Well-maintained hardwood floor has better resale value than laminate unless the floorboards or finish are in poor condition. Appearance From a distance, quality laminate flooring can look much like real wood. Higher quality laminates have a lower frequency of pattern repetition, too. Solid hardwood floor is highly attractive. Even cheaper species of real hardwood (red or white oak) can be more attractive than laminate&apos;s artificial "premium" exotic species. Below-Grade Installation While laminate flooring can be installed below-grade, it is still not the best flooring for basements. It is not recommended to install solid hardwood flooring below-grade. Moisture-Tolerance Laminate surfaces are highly water- and stain-resistant, but water getting into the joints between planks causes the edges to swell and chip. It is not recommended in wet areas, like bathrooms. Also not recommended for wet areas, hardwood is a fairly popular choice in kitchens. It can be damaged by standing water and floods but is resilient and can be repaired, where laminate cannot. Floating Floor Laminate is always installed as a floating floor. Solid hardwood flooring is never installed on a floating floor basis; however, some engineered wood floors will install in this fashion. Install Over Radiant Heating Yes. Unless expressly not allowed, most laminates can have radiant heating under them. Not recommended; however, solid hardwood&apos;s natural insulating properties lessen the need for radiant heating. Pets Laminate is an excellent floor to install in a house with pets. Its wear layer performs well against dog claws. Wood tends to gouge. Purchasing more expensive and harder hardwoods and laying down mats can help mitigate this problem. Impact-Resistance Moderate. If an object is heavy enough and hits laminate with sufficient force, the floor will be gouged all the way down to the fiberboard base. Excellent. Solid hardwood can tolerate the most brutal impacts. Species selection can greatly influence this, though. Extremely hard tropical woods are virtually dent-proof. Unusual Things To Expect Laminate flooring can build up static, a phenomenon that can be cured with regular cleaning. Wood may contract (shrink), leaving gaps between boards. This may happen over long periods of time, even when the wood is not subjected to extreme moisture. Buy It If: You want your floor to be simple to install, cheap, and easy to maintain. You are aiming to put maximum value into your house, not just for yourself but for future owners.